Gail Collins-Ranadive was not excited when she was assigned to Las Vegas as an interim Unitarian minister. When she arrived, Gail learned that her congregation maintained a trail at the Red Rock Canyon National Conservation Area. So after Gail survived standing in line at the Department of Motor Vehicles to register her car and driver’s license, she decided to celebrate by heading right out to Red Rock Canyon to purchase her annual pass. For all of us who love Red Rock Canyon, we know she was off to a great start in Nevada. “Chewing Sand” is Gail Collins-Randive’s collection of essays about the Mojave Desert and how its landscape became her “sacred text for contemplation.” You will smile as she shares experiences all we transplants from the East and Midwest have had…forgetting how to turn on the windshield wipers because it’s been so long since you used them; seeing our first double rainbow; replacing landscape grass with rock to save water; spotting burros for the first time in First Creek; watching a coyote roam your neighborhood. Her essays honor the sights and sounds of Red Rock Canyon trails, The Springs Preserve, Valley of Fire State Park, Sloan Canyon and the work of organizations whose goal is to preserve and protect these areas. Gail has a new book coming out soon, “A Fistful of Stars: Communing With the Cosmos.” An ardent climate activist, she is also working on a book about the climate change crisis. “Chewing Sand” is an award-winning book published by independent publisher Homebound Publications and is available in the Elements Gift and Book Store in the Red Rock Canyon Visitor Center and on Amazon. Bobcats weight 15 to 25 pounds and mountain lions between 100 and 200; there are four types of skunks in the southwest, four types of mice and five types of squirrels; a white-nosed coati is a close relative of the raccoon; kit fox are also known as desert fox; the cute and adorable black-tailed jackrabbit and antelope jackrabbit are actually hares with ears six to seven inches long; the southern long-nosed bat is an important pollinator in the desert of the southwest. This is just a sample of the information found in “50 Common Mammals of the Southwest,” George Olin’s guidebook in identifying animals that live near us. 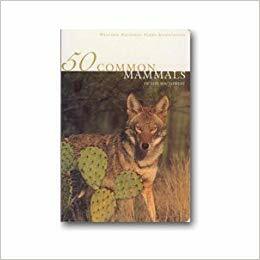 “50 Common Mammals of the Southwest” is one of eight books sold in Elements that are published by Western National Parks Association (WNPA) of Tucson, Arizona. Cacti, butterflies, dragonflies, birds, plants and wildflowers are the topics of the other WNPA guidebooks found in Elements Gift and Book Store. Also, Amazon has more books from Western National Parks Association covering topics about Southwest parks, hikes, history, geology, explorers and conservationists, plants and animals.